(Verslag van het congres in het Nederlands. Click on the picture to the right to order the book - in Dutch!). We had been invited by our friend Aitor Iriarte from Bilbao, Spain, to accompany him to the symposium about the famous 'Deurne' helmet. 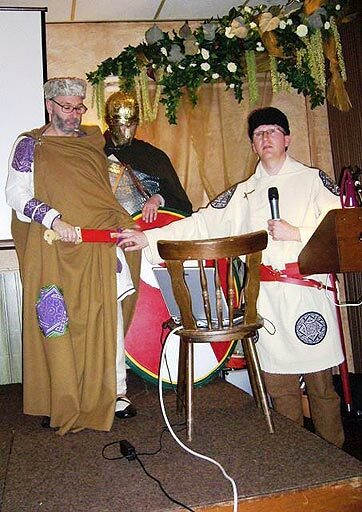 Aitor was to present a paper about his reconstruction of several items from the Late Roman find, and he thought it would be a good accasion if we were to 'stand guard' as Late Roman soldiers while he presented his case, dressed as a Late Roman tribune. We thought so too! The symposium was held at the Oranje Hotel in Meijel, Limburg, The Netherlands. Not far from there the helmet had been found in the Helenaveen, now almost a century ago, by a peat digger called Gebbel Smolenaars. Deurne, the name under which people know the helm, is the town closest by. The hotel had room for about 120 guests and the room was quite full. Apart from Aitor there were 6 more speakers, each of them presenting a paper or a topic about the find or the circumstances surrounding it. The day started around 10 and was to last until 6 in the evening. In itself the symposium was not just something, it was very clear that tension still ran high among the locals! Scholars who had been investigating the whereabouts of seemingly worthless objects such as pieces of leather sometimes got to see them, but also ran into far less friendly replies. In my opinion, it is rather unusual for a Late Roman find to be so vividly remembered after almost a century - one guest told the audience about his father-in-law, who had been present at the find, and who could still get emotional about it. 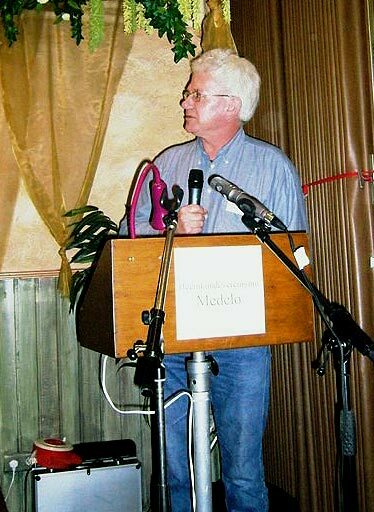 The first to speak was Dr. Jos Pouls (professor Cultural Science, Open University), who refreshed the memories of the audience about the finder, Gebbel Smolenaars. He took a deeper look into the circumstances of the find, media attention at the time and the letter written about it later. His presentation painted a good picture of what did or did not actually happen during the find, something very important to judge the finds themselves. Next in line was Dr. Carol van Driel-Murray (professor Provincial Roman Archaeology, University of Amsterdam), a reknowned expert in ancient leather and footwear, and her presentation discussion the shoes and other leather pieces found at the site. She, too, had dressed for the occasion in a Roman dress with on her feet the replicas of 4th-c. shoes found at Cuijck, very similar to one shoe found at Deurne. 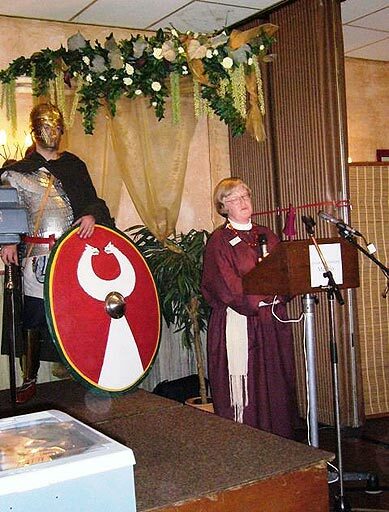 I was asked to extend my 'guard duty' to her presentation and gladly complied. In her presentation, Carol made a case about the whole find being not lost or from an accident, but intentionally deposited inside a leather tent. The helmet was supposedly encased in a leather bag (supplied by Aitor Iriarte of course) and discovered while still inside. In her professional opinion, around 320 AD the owner and his servants had wilfully laid down their Roman identity in an offer to the gods. This theory seemed well-founded and truly put an end once and for all to the age-old tale of a lone Roman rider, dronwed in the bog. However, there were some items missing to support that theory, such as the military belt (cingulum). besides, there is no proof that all the items found were even buried in one spot. Also, the theory that the helmet was damaged during the discovery does not seem to fit with the facts. And I must say that while I don't support the 'accidental drowning' theory, I must say this explanation has too many setbacks to be acceptable in full. Aitor generated a lot of interest amongst the visitors - here during lunch break. The helmet fits in the bag! Last speaker before lunch was Drs. 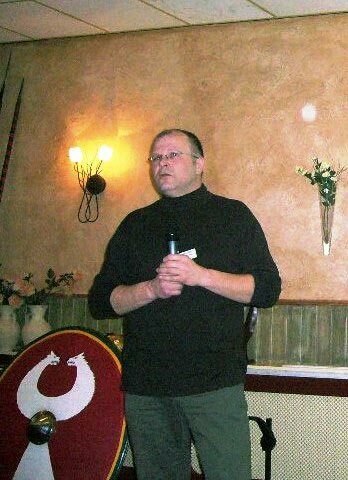 Nico Arts (County archaeologist of the cities of Eindhoven and Helmond), who held a review about archaeology of the region, especially about so-called 'wet' deposits. Such deposits in the bog are not uncommon in the Peel, the area between the Meuse Valley to the East and Brabant to the West. 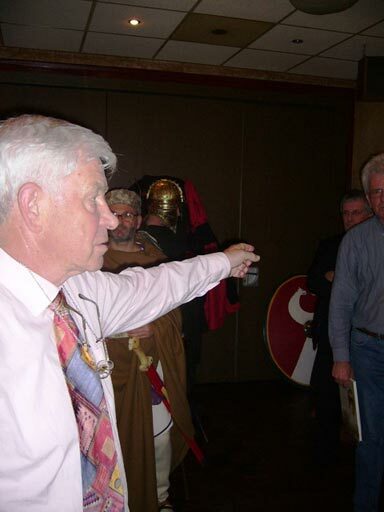 His presentation strenghtened the case for the Deurne helmet also belonging to such a deposit. After lunch, it was the turn of Aitor Iriarte (Architect, city of Bilbao, Spain). Like Carol before him, his topic was not so much the find itself but his attempts to re-create almost all of the items in that find. 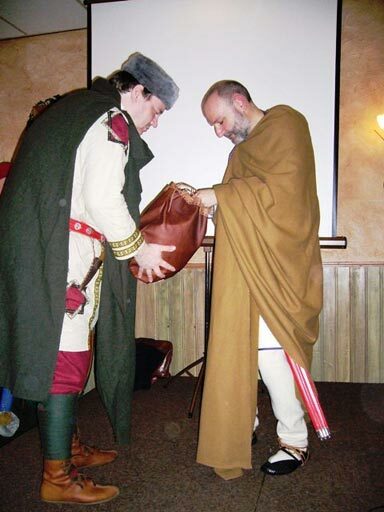 Over the past decade he managed to re-create much of the helmet, the shoes, the sword-sheath, spurs, helmet bag (once erronenously known as the 'purse') and many other items of a Late Roman cavalryman, not necessarily found with the helmet. Despite his lecture being in English the audience still received a good picture of what a Late Roman cavalryman carried with him at the time. After finishing his own fascinating tale, Aitor placed some remarks with Carol's previous account but he, too, generally agred with the main conclusion. 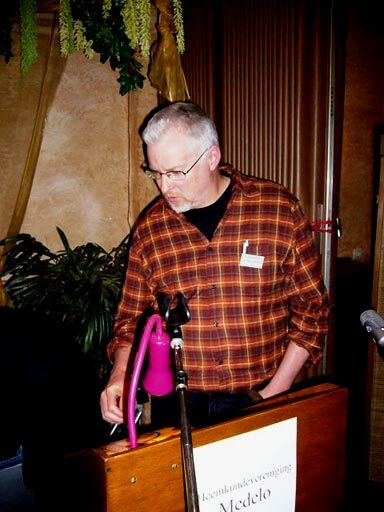 Next in line was Dr. Hans Joosten (Bogs and Paleo-ecology, University of Greifswald, Germany), who had a very technical but also very attractive presentation. His paper was about the biological evidence, describing the findspot as it would have looked around 320 AD. Even though the technical terms must have sounded alien to most of the audience, his presentation made it into a very thrilling detective-story. Joosten and his team are most responcible for the end of the 'drowned officer' myth. Besides no traces of a body (the spot was by no means 'boggy' enough to sink in), the evidence makes it clear that the helmet was very much near the surface when first deposited. That makes a deliberate burial very attractive, although personally I think it possible that the package containing the helmet could also have been lost accidentally. The rest of the finds don't point automatically to a religious deposit, even though they surely don't exclude it. I hold van Driel-Murray's 'identity-offering' for unproven, because of the reasons mentioned above. Joosten, when asked, thought the 'accidental loss' unlikely but not to be ruled out. 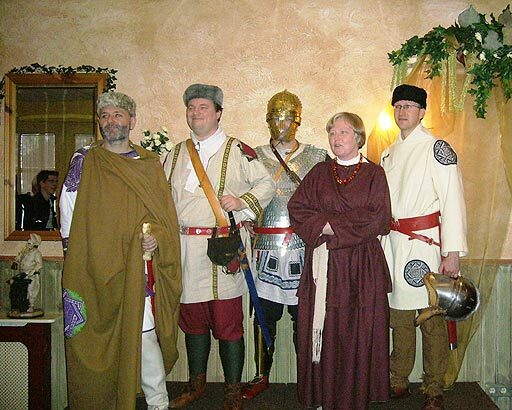 The Late Romans on stage: Aitor, Andreas, Robert, Carol and Maarten. The speakers: Herman Crompvoets, Carol van Driel-Murray, Maarten Dolmans, Nico Arts, Hans Joosten and Jos Pouls. Drs. Maarten Dolmans (Archaeologist, city of Venlo) was next in line. He took the historical approach, painting a very in-depth picture of the Roman military and the state of the Empire. He then went on to describe what 'our man' might have looked like, where he came from, how he joined the army and where he went on his travels. 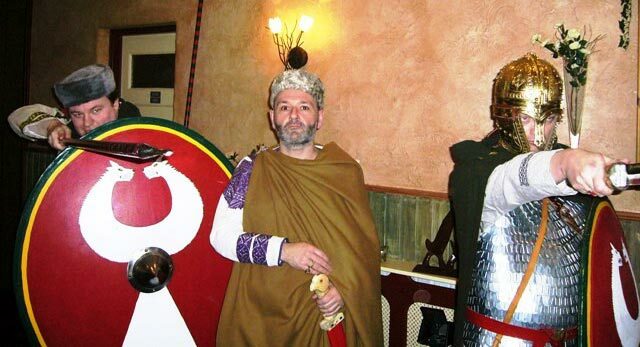 As a probable officer, the man may have served with the elite cavalry that accompaning the Emperor Constantine the Great during his moves from capital to capital and from war to war. Whatever he did in The Peel will forever remain unclear, and how the helmet got to be where it was found was something that Maarten Dolmans did not know for sure either. And while the desposit-theory seemed the most likely, Dolmans kept open the possibility of accidental loss. Dr. Herman Crompvoets (Language expert and teacher, retired) was the last to speak, adressing the image of the find in the minds of the people during the years since the discovery. The notion of 'treasure' had been real strong, after all. he also spoke about the mystic Leo Kluijtmans, who added a supernatural dimension to the whole case, with the Roman who had 'spoken to him in visions'. But Crompvoets was clear on this - to believe or disbelieve the mystic was a case of belief, not science. The book was presented around 16.30, after the ubiquitous delays to the programme. 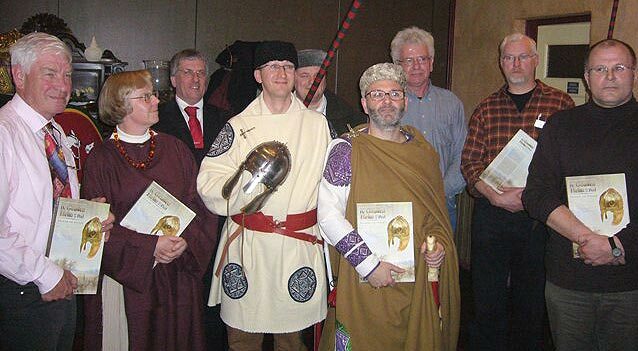 Pouls and Crompvoets proudly realted of their efforts to get it published, after which all speakers were once more gathered at the front and presented with the first volumes of the book De Gouden Helm uit de Peel, Feiten en visies. After this ceremony, a discussion followed, where each member of the audience was able to ask questions of the speakers. All in all this was a very satisfying symposium, with many new insights and answers to old questions. Scientifically, in my opinion we went a long way from semi-legendary drowned Romans to a real discussion about what was found. I'm not convinced by the new 'common ground' of the deposit theory though, which in my opinion goes too far without real answers to the problems that arise with this new theory. But time will surely address that issue. Pouls, Jos H. en Herman J.G. Crompvoets (eds.) 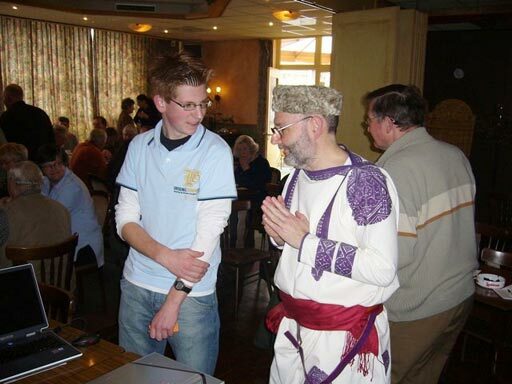 (2006): De Gouden Helm uit de Peel, Congres over de Gouden Helm uit de Peel op 25 maart 2006. Pouls, Jos H. (2006): De vondst, de vinder en de mogelijke toedracht, in: Pouls, Jos H. en Herman J.G. Crompvoets eds. : De Gouden Helm uit de Peel, pp. 7-32. Driel-Murray, Carol van (2006): Een spookrijder in het veen: de reconstructie van een depotvondst, in: Pouls, Jos H. en Herman J.G. Crompvoets eds. : De Gouden Helm uit de Peel, pp. 33-51. Joosten, Hans, Pim de Klerk, Klemens Karlow en Anja Prager (2006): De natuurlijke context van de vindplaats, in: Pouls, Jos H. en Herman J.G. Crompvoets eds. : De Gouden Helm uit de Peel, pp. 52-69. Arts, Nico (2006): De archeologische betekenis van natte plaatsen op de Zuid-Nederlandse zandgronden, in: Pouls, Jos H. en Herman J.G. Crompvoets eds. : De Gouden Helm uit de Peel, pp. 70-78. Iriarte, Aitor (2006): De reconstructie van de militaire uitrusting, in: Pouls, Jos H. en Herman J.G. Crompvoets eds. : De Gouden Helm uit de Peel, pp. 79-90. Dolmans, Maarten Th.R.M. 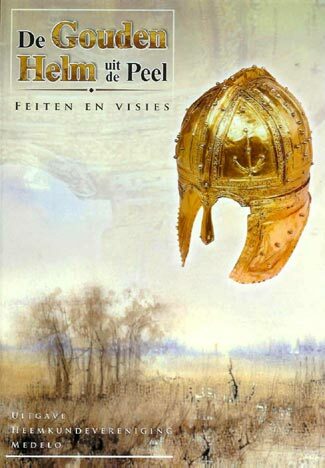 (2006): 'De man van Deurne'in historisch en archeologisch perspectief: een poging tot reconstructie, in: Pouls, Jos H. en Herman J.G. Crompvoets eds. : De Gouden Helm uit de Peel, pp. 91-114. Crompvoets, Herman J.G. (2006): De roep van de Romein, in: Pouls, Jos H. en Herman J.G. Crompvoets eds. : De Gouden Helm uit de Peel, pp. 115-34. Pouls, Jos H. en Herman J.G. Crompvoets (2006): Popularisering en beeldvorming rond Gebbel en zijn Gouden Helm, in: Pouls, Jos H. en Herman J.G. Crompvoets eds. : De Gouden Helm uit de Peel, pp. 135-8.